Fort Caroline is two stories; a story of the first French settlement, and the story of murder and revenge. Hearing the history of Fort Caroline from the Beaches Museum Executive Director Dr. van de Gutche my friend Rose Hammitt and I had to see firsthand where all this history happened. When he arrived in May of 1562, Ribault found the local Indians, the Timucuans under the leadership of Chief Saturiwa to be friendly. The Timucuans had lived in Florida and Georgia for the past thousand years, this meeting was to be the beginning of the end for the Indians. Before leaving Florida, Ribault erected a monument then returned to France. Another expedition under the leadership of René Goulaine de Laudonnière, who had previously sailed with Ribault came back and established Fort Caroline on June 22, 1564. With 200 soldiers and artisans and help from the Timucua Indians, the colonists began building a village and fort naming the area La Caroline after their king, Charles IX. The settlement would not last long. Starvation, disease and mutiny within the walls of the fort played its part in destroying morale before the Spanish ever arrived to finish what the French had begun. Relations with the Timucans went south and bands of settlers left the colony. Plans underway to return home to France were halted in August of 1565, when Ribault arrived with a relief expedition. The additional supplies, 600 soldiers and settlers, including more women and some children made the needed difference. Spain was a problem. They were concerned over the French settlement. With already established routes in South and Central America, Spain worried the French settlement might plunder their treasure ships filled with gold, while they followed the Florida coast on their voyage home. To take care of the matter, Phillip II of Spain sent Admiral Pedro Menendez to remove the French from Florida. It was Menendez that established what would become the now oldest city in the US, St. Augustine. Fates played a cruel trick on the French. As Ribault sailed down the coast seeking to attack the Spanish, his ships were destroyed by a hurricane. In the meantime, Menendez with 500 soldiers marched toward the Fort Caroline. Surprising the French, it was an easy win. Only around forty or fifty French people, including Laudonniere, reached ships and were able to flee and sail for France. Out of the remaining 200 people, only about 60 women and children were spared. The Fort was renamed Fort San Mateo and was now under Spanish rule. On Menendez’s return march to St. Augustine, he found the shipwrecked Frenchmen, Ribault among them and slaughtered about 350 men – all but those professing to be Catholics at place later named Matanzas (“Slaughter”). When touring St. Augustine, they told the story of how the blood ran red in the bay. We saw the Huguenot’s cemetery. The memory of the slaughter of the French Colony was not forgotten, in August of 1567 French leader De Gourges departed for Florida. Arriving in April of 1568, just six years after Ribault’s first stop on the Florida shores, De Gourges took the two Forts, massacred the Spanish, and on May 3rd left Florida for France. 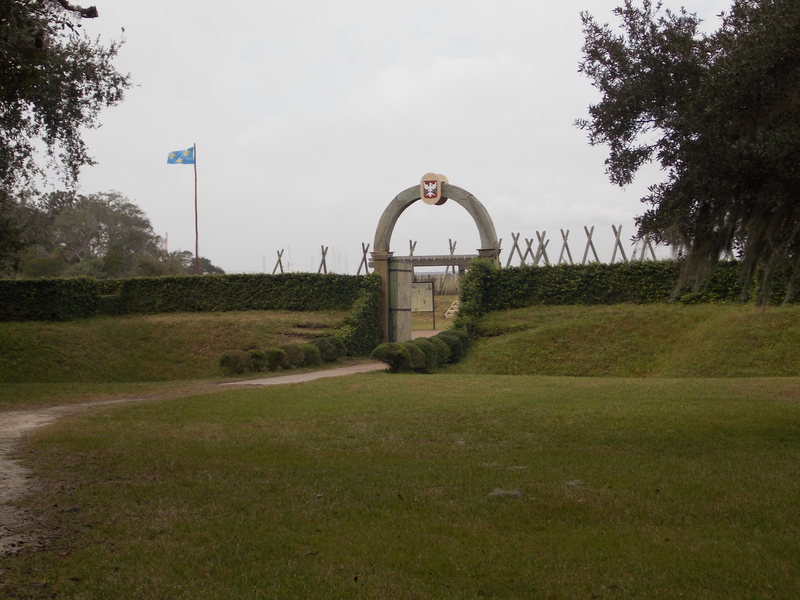 After all the blood, sweat and violence that the French suffered, historians believe that the original Fort Caroline washed away during the late 19th century. Today near the original memorial that Ribault placed, a replica was erected based on sketches by the settlement’s cartographer, Jacques le Moyne. The memorial also features the visitor center for the Timucuan Ecological and Historic Preserve that a collection of rare Timucuan artifacts. Come see this, the earliest American history for yourself. Log onto http://www.npca.org/parks/fort-caroline-national-memorial.html?adwords=1&gclid=CN2MlfyyhbsCFa9DMgod7jgAYQ for more information.